Catholic Charities provides a large variety of programs to help people with support services from pregnancy support to disaster relief. Among these many programs is El programa hispano. This program provides many services like emergency services, Project UNICA: Domestic Violence and Sexual Assault Services, Parent/Child Development Services, School-Services for Youth & Their Families and lastly Support Services where one can find information about the Low Income Tax Clinic (LITC). I have never seemed to find the right time to volunteer in the past. It was something that I felt was lacking in my character that I never sought out this experience for one reason or another. In an attempt to better myself by helping others, I decided to make the jump and email Karen Keating, the coordinator for El programa hispano. The work they are doing on behalf of the hispanic community, in whatever location they can reach, is admirable and very much needed. I decided to push aside my own insecurities and step outside of my comfort zone to do what I can and put my skills as a Spanish speaker to use. I qualify as a Spanish speaking tax preparer, but I am a volunteer and am not in any way licensed to give the final word on someone's tax return. Though I do have a certificate that says I have studied and passed the test on this subject, and I know how to process and input their information for review by a professional. For this reason I am only the 2nd step one takes in the e-filing process. There are three steps a client goes through to finish. The first step is the Intake/Interview & Quality Review Sheet form below. Another volunteer helps them filling this out and that the client has all of the forms and information necessary to file that day. However, since we typically deal with low income people, we are not trained in some subjects that are unlikely for us to come across. We are unable to help the people who have, for example, military income, a business, and anything that would require a professional tax expert to help them. So these people must find a tax preparer that is qualified to file their tax return on their own. The second step is with me, the tax preparer, I am trained in what everything in the form below means and how to find that information and input it correctly into the computer program provided for our use. I look for inconsistencies, ask questions, verify information and also give information when needed. Lastly, the third step is with the quality reviewer. They are the people who have experience with taxes professionally and they review my work to make sure it is accurate, that I didn't miss any information and they are the ones that e-file for the client and tell them what their refund is. Above is the first page of the intake form that a person fills out when they walk in the door. 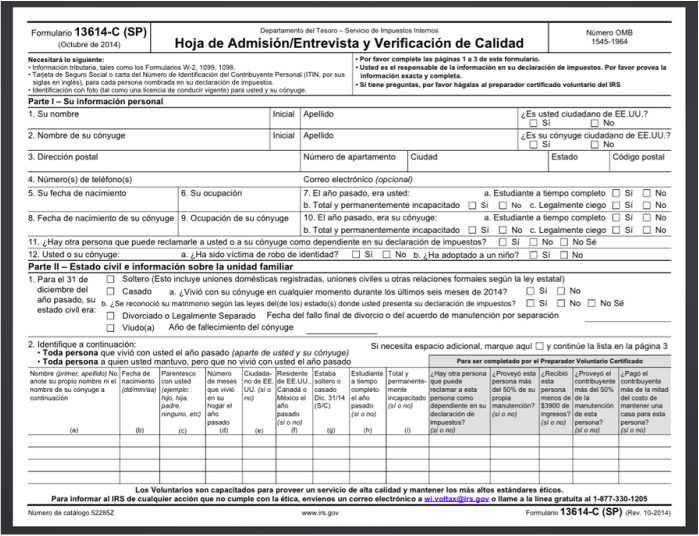 This form gives us, the tax preparer, a window into their lives and financial situation. This may seem like a convoluted mess, but with practice and understanding this is the basic information of a someone's personal life. I will know by looking at this first page what their name is, if they are married, what they do for living, if they are a US citizen, and who they love and take care of. I get to spend a few hours with someone new and find out who they are. They are as varied in personality as you can imagine and while there are always a few bad apples, the others will only be sweeter in comparison. Yes, taxes aren't fun, but the experience of volunteering at El programa hispano isn't so much about just doing taxes, it is getting to experience the best of humanity. ~ Adjacency pairs are important. Familiarizing myself with the forms was the hardest part of these plans. The form numbers do not always match up with that same number in the computer program. I have to learn round-about ways to input these forms correctly. This gets easier with practice though and every time I work the easier it is. Lastly, learning the vocabulary and becoming more familiar with speaking with a large variety of people from different cultures comes easier as I read and seek out more forms of conversation. My time with this program tested my ability to handle stressful situations. The first few weeks were very hard for me. There was a lot of responsibility and deadlines for learning the required textbook like material. This was almost like taking another course load to my already full class schedule at PSU. Next year I will probably choose another volunteer opportunity that is less demanding. This is a volunteer position that requires a lot of dedication and time to fulfill. I honestly believe that it is highly rewarding and worth the effort if a person has it to give. However it is not a light and fluffy volunteer position and it requires a serious commitment for the sake of the organization and most importantly for the clients who depend on the services this organization provide. For those who who do well in this environment, they will be rewarded tenfold for their time and attention. The best way to help the people in this community is to get more Spanish speakers to volunteer. The more help that we have, the less time people wait and the more people we can help.